The burrowing amphibians “exhibit an intriguing and highly specialized reproductive behavior,” the team’s leader, University of Delhi professor Sathyabhama Das Biju, told The Times of India. Residents of the area had mistaken the amphibians for snakes, the Indian news outlet reported. 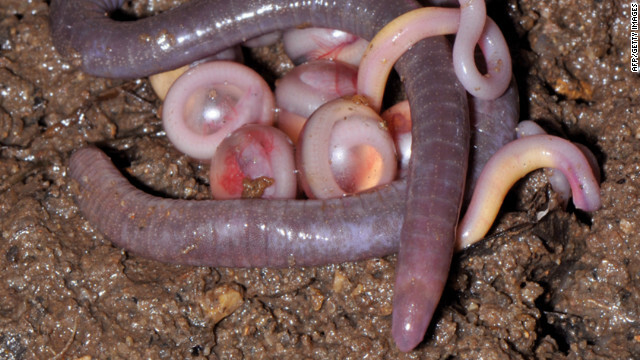 Chikilidae’s link to the African caecilians, and its divergence and survival in Northeast India during the subcontinent’s isolation before it joined with Asia, suggests the area had long-term ecological stability. That suggests it might have more life endemic to that region than is currently recognized, the scientists say in the report. Scientists traditionally have viewed Northeast India as just a passageway where flora and fauna moved between biodiversity hotspots in Southeast Asia and a different part of India, Church said. “Now, with a study like this, we realize that this part of the world is important not just for the movement of plants and animals between the Indian subcontinent and southeast Asia, but an important area for evolution in its own right,” Church said. “This discovery begs the question: What else has happened up there in terms of evolution of life in Northeast India?” he added. Geographically distinct Northeast India has not been studied well, and many other undocumented creatures and flora may await there, according to the team. The region is almost cut off from the rest of India, nearly surrounded by Bangladesh, Myanmar and China. Time, they say, is of the essence. “Further explorations and conservation actions are urgent because the region’s biodiversity is generally under high threat from the growing resident human population and rapid deforestation,” the scientists say in their report. Thank you for another informative site. Where else could I am getting that type of info written in such an ideal approach? I've a venture that I'm simply now working on, and I have been at the glance out for such info.